// the following figures are mmeant to be similarand are meant to look like legs. I restarted this project a few times. I wanted to experiment using the look system and incorporate the various functionalities I discovered in one piece. Although a bit abstract, the image above is supposed to depict a person crossing the street on a raining day. More importantly, the image uses short and frequent lines to simulate rain in the back layer of the image. By connecting many points to pixel, I was able to simulate distance and light using white lines. for the rest of the images I tried to emulate the stage of walking. with the green lines representing stepping forward in how the “knee” moves downward. In the future I hope to be able to use these with animation to simulate movement. In this project, I wanted to utilize the curving shape created by straight lines to create gradient by overlapping lines. The white lines overlap to create a gradient color in the background as well as creating shapes that embrace the center part. For this project I really wanted to keep the composition simple and just focus on learning how draw with for loops. I played around with CMYK color and how they can interact, but again my goal was to keep it simple and clean. I tried to make it more dynamic by adding gradient color and a mouseDragged function, so whenever the mouse is dragged the stroke Weight increases. I was trying to create intricate spaces reminiscent of a stained glass window taken to the extreme. I used multiple grids along the edges of the canvas to create the pattern. The different color creating a depth to the pattern. For my project, I wanted to play around with curves that met in the middle of the screen. 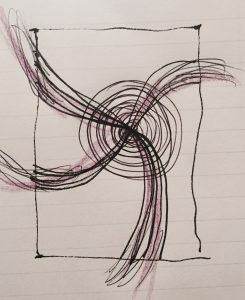 I drew 4 blue curves that all met at the center point. After drawing these I realized that the negative space looked like it was spelling my initials — DC! So I filled in letter holes to make the DC pop out more, and then topped the piece with 4 more red curves on top for added depth. //leads to different types of spirals. 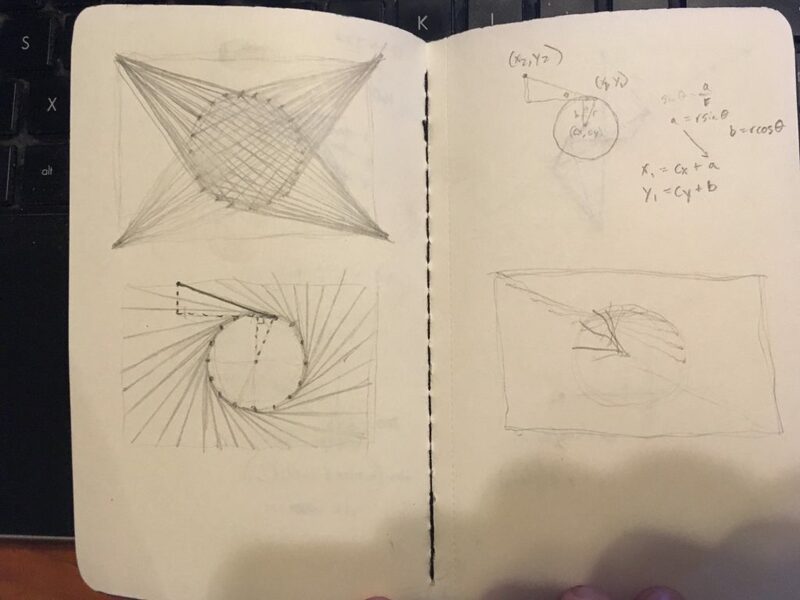 I wanted to use trigonometry to create a series of points predicated on circular geometry and then connect the points to various other points across the canvas. I ended up using recursion to generate a central spiral. I then used the mouse position to control the degree to which the length of strings in the spiral decimates (the rate at which the strings spiral towards the center) and to control the rotational rate of the strings in the spiral, so that spirals of various character could be created. 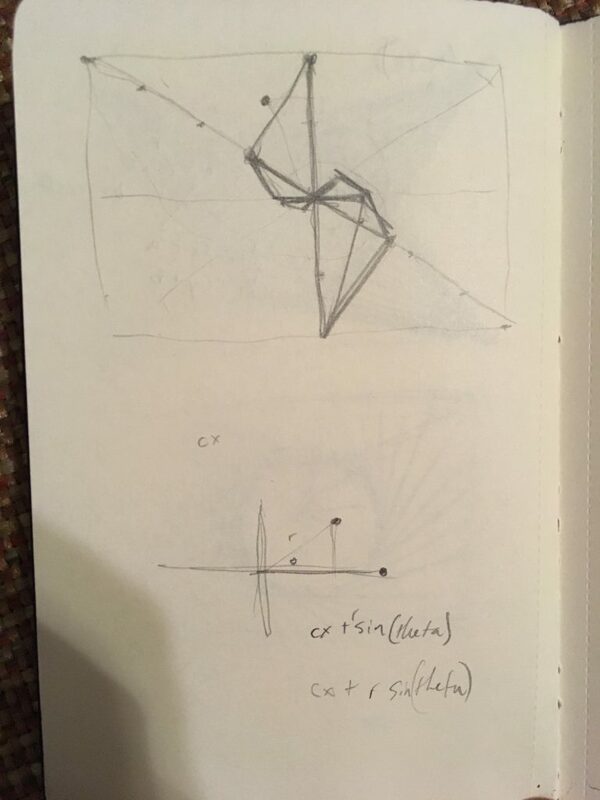 Early sketches showing ideas relating to circular arrays of points. 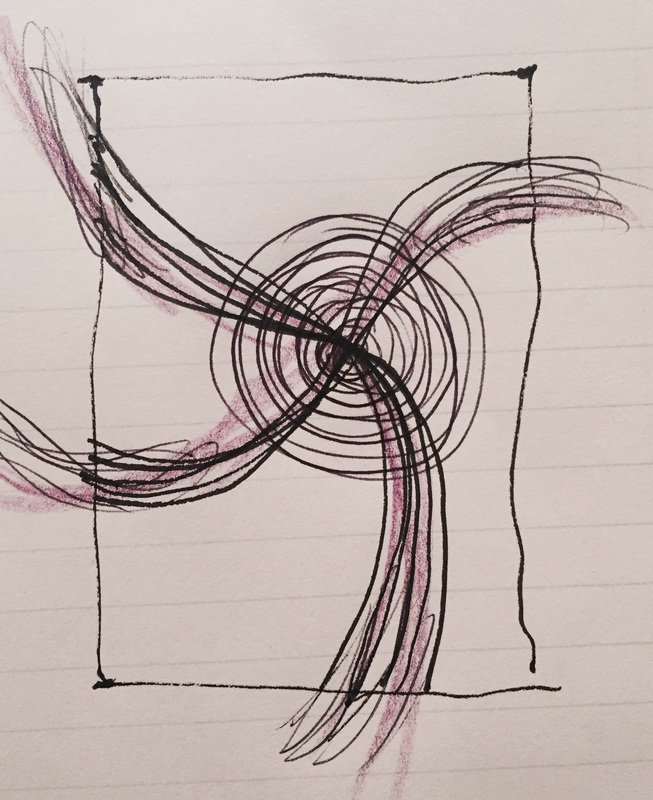 Later sketch focusing on spiral series generated from recursive rules. With this project I explored using arrayed curves to mimic ribbons across the defined canvas. By focusing in on the intersection points of the two ribbons using ellipses, the intent was to create depth using tone and varying line weights.